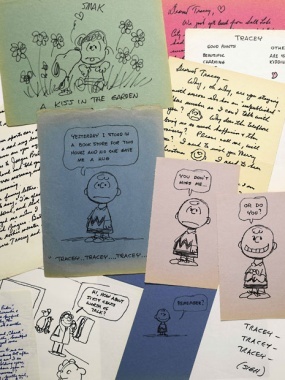 In pictures: This photo provided by Sotheby's in New York shows some of the romantic letters and drawings the late Peanuts creator Charles Schultz sent to a young woman 23 years his junior, who infatuated him. The love notes are from 1970-1971. This photo provided by Sotheby's in New York shows some of the romantic letters and drawings the late Peanuts creator Charles Schultz sent to a young woman 23 years his junior, who infatuated him. The love notes are from 1970-1971.